WALDORF, Md.—To a casual observer, Regency Furniture Stadium, home of the Southern Maryland Blue Crabs baseball team, probably looked like it was playing host to a weekend autocross. There were cones set up in the empty lot as I pulled in and some interesting cars to park alongside, many displaying the subtle tells of trackday service. But on this unseasonably cold and windswept Sunday morning, something else was afoot. The cones were not arranged in the sinuous, continuous course you might expect if time trials were the order of the day. A closer look revealed that more was going on here. 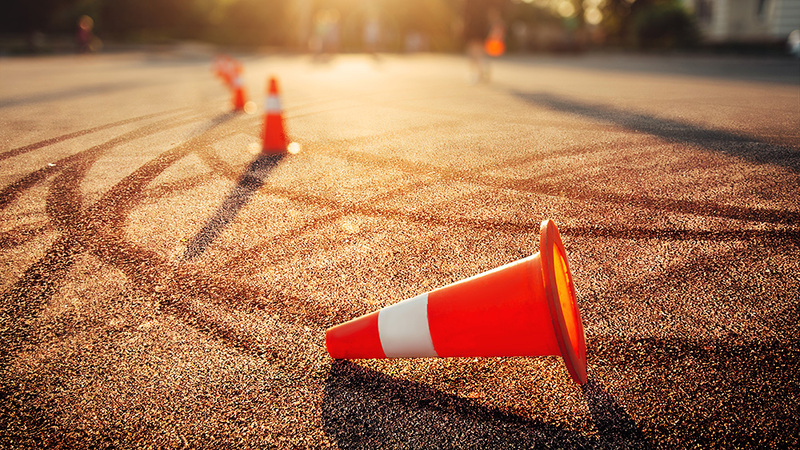 To one side of the stadium’s parking lot, a cone sat alone in the middle of a wide expanse of tarmac. Elsewhere, others were clustered together to delineate other obstacles to negotiate—a slalom course and so on. And while a handful of the cars up front obviously belonged to enthusiasts, the vast majority were much more… suburban. That’s because I was actually here to visit a local event being held by the Tire Rack Street Survival school. It’s just one of a number of events that take place across the country with the goal of instilling good driving habits in impressionable young minds. You don’t have to squint to see the need for programs like these. More than 37,000 people die on US roads each year, and drivers under the age of 25 are well represented in the annual tabulations. But the data is more complicated than that, and road deaths among young drivers have actually been on the decrease compared to a 29-percent year-on-year increase in fatal crashes involving drivers over the age of 65. Getting our elderly drivers to go to a car-control clinic would probably be a brilliant idea, too, but it’s easier to get ’em while they’re young, particularly if you’re the responsible adult who provides the vehicle, insurance, and gas money. Hence the collection of parents giving up their Sunday mornings (and paying $95) to spend time with their teen drivers and some cones.